In 1969, Pete Jeffrey first entered the Industry of Recreation, Parks, Physical Education, and Health. By 1974, he was on his own, founding Pete Jeffrey and Associates, which ultimately became incorporated in 1977. In time, we have earned the reputation of being the leader throughout Western Pennsylvania. Today, we offer innovative products, design, installation, service and care to all School, Municipal, Recreation, Park, and public institutions. Architects, Landscape Architects, Engineers, Planners, Designers, and Developers are among the professionals who have come to know and trust us in assisting in making great projects a reality. Over the years, Pete has been joined in business by his three sons Chris, Brian, and Mike, and daughter, Jill. Long ago, as kids, they were his original playground “testers”. Now, through years of hands on experience, literally from the ground up, they are the heart and soul of a family business that does it all. 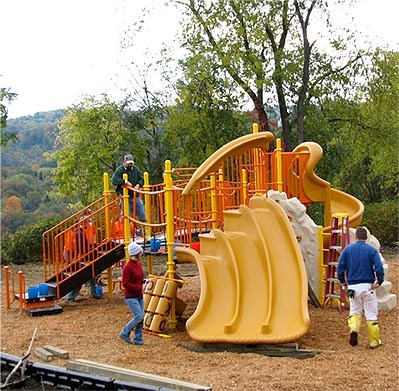 Playworld Systems, our featured manufacturer, is a family owned business who has become a global leader in the industry. They are headquartered right here in Pennsylvania. Creative and imaginative products, along with dependable, trustworthy service, make Playworld our resource for every project.